If you're looking for a multi-use product, that is great for your skin, and smells like roses, well... this is the one for you. It has felt like a super long Winter, and my skin has been begging for some extra moisture. Once I read all of the claims this beauty balm made, I knew I had to give it a try. As pictured above, you can see how it arrived to me. 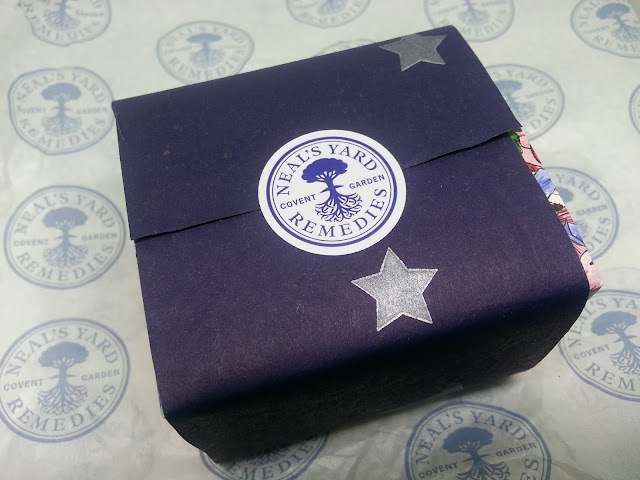 Wrapped in blue and a Neal's Yard Remedies sticker. I had never heard of the company before, so here's a little background information. Neal’s Yard Remedies first opened their doors in London, England nearly forty years ago as an apothecary, and today, their roots in natural plant-based remedies are evident in each of their luxurious health and beauty products. Neal’s Yard Remedies ethos is simple: do good, feel good, and look good. This manifests as a company dedicated to protecting our fragile planet and all its inhabitants. 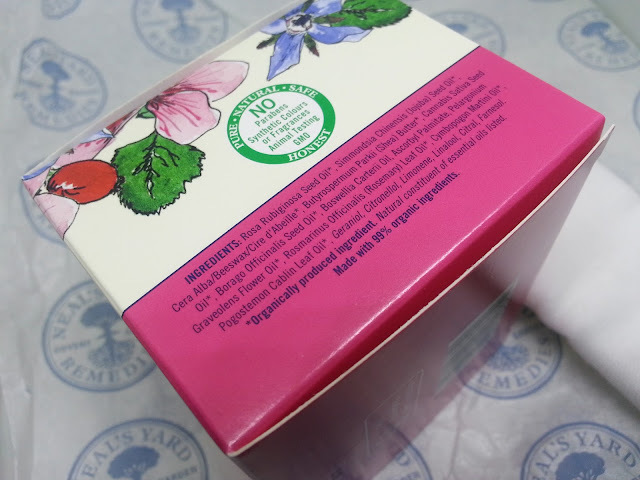 Neal’s Yard Remedies only uses natural and organic ingredients free of harmful chemicals. They have never tested on animals, and are committed to trading ethically and fairly. The passion and care that is infused into all parts of the company is notable – the company boasts a lengthy list of awards, including Best Ethical Brand and Best Organic Skincare Brand. 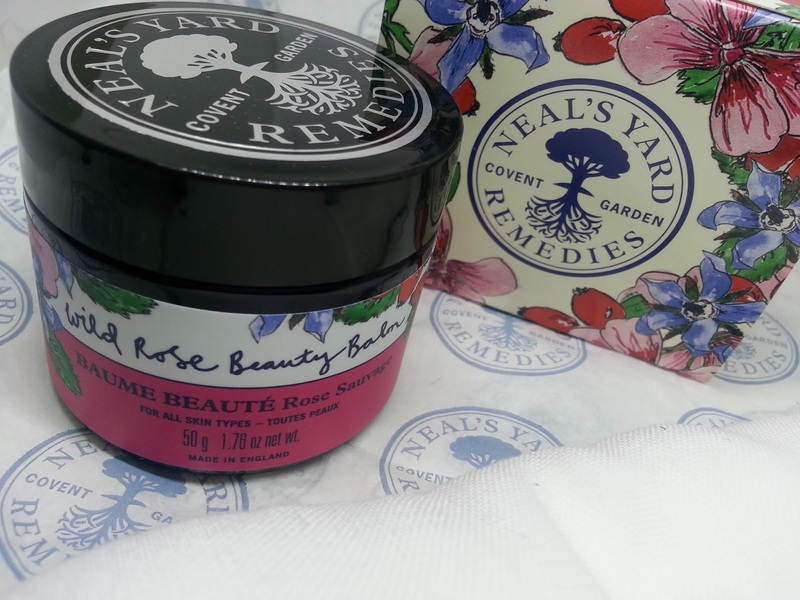 In addition, Neal’s Yard Remedies was the first organic skincare accredited by the Soil Association. First off, this box is beautiful! No parabens, synthetic colours or fragrances, animal testing, or GMO. 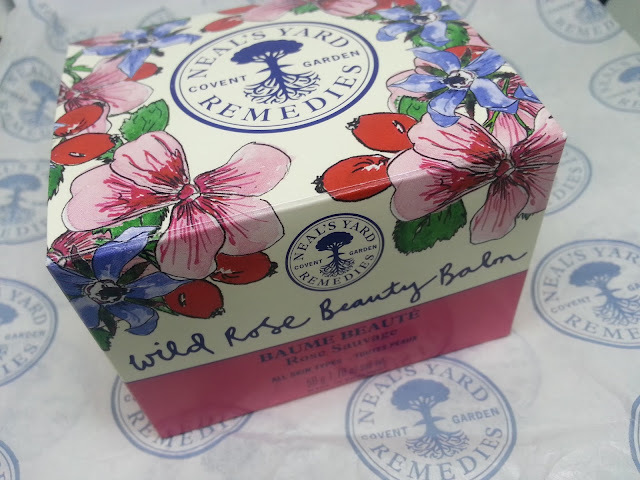 Wild Rose Beauty Balm is made with 99% organic ingredients. 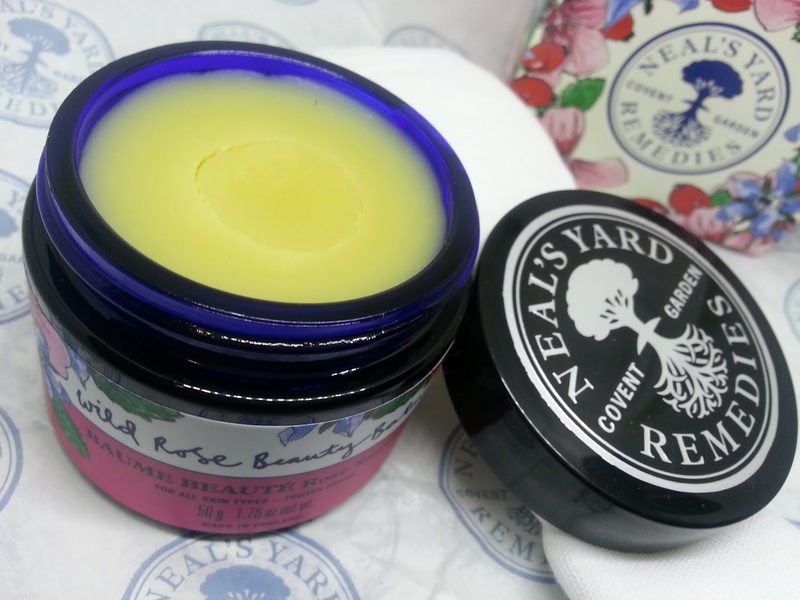 Inside is a glass jar, filled with 50g of the beauty balm. I did find that a little goes a long way when you use it. Also included in the box was a muslin cloth, you can kind of see it in the bottom right of this photo. It looks just like your typical balm, and is most definitely rose scented. If you have reactions to scented skin care, then you may need to be careful with this one. Now, let's talk about what type of use you can get out of this multipurpose balm. Remove excess makeup. Moisten skin with warm water then gently massage on the balm. Rinse with warm water and pat dry. Cleanse as above, then use the muslin cloth, dampened with hot water, to wipe away the balm in a gentle, circular movement. Apply sparingly to clean, dry skin. Paying particular attention to dry and dehydrated areas. Apply to freshly cleansed skin, then cover face with a hand-hot we muslin cloth, to open pores. Repeat. Remove the cloth, lie back for 30 minutes and relax. Wipe away the balm with hot, wet muslin cloth. Finish by covering face with cold, wet muslin cloth to close the pores. Pat dry. I actually used this beauty balm a few different ways. As soon as I received it, I immediately tried it as the cleanser to remove my makeup. It did remove my face makeup, but I didn't use it on my eyes because it is so heavily fragranced. It did do a good job removing my makeup, but I did find that it was difficult to wash off, and the balm was a little too thick and left a film behind on my face. I also used this as an exfoliator with the muslin cloth. This time I removed my makeup prior, and then while my skin was damp, I applied the balm. Once it was applied, I used the warm muslin cloth to gently exfoliate my skin. I liked it this way because my skin felt so smooth, and it didn't dry out my skin like other exfoliators do. One rainy day I decided to use the balm as a mask while soaking in a bubble bath. For this I washed my face first, and followed the instructions for the balancing mask. It was relaxing, but just like using this as the cleanser, I found it hard to fully rinse off, and had to use the cold muslin cloth to remove the remaining balm. My most favourite way to use this beauty balm though would be using it as the final step in my skincare routine. In place of a sleep pack, I would apply this over my night cream, so it would seal everything in. And let me tell you, my skin LOVED it. I was having some issues with my skin a week before I got this. It was rough, and had lots of dry patches. Less than a week of using the balm as my final step in my routine, the dry patches were going away. I had them on my forehead, above my lip, and under my eyes. I have no idea how they appeared (I'm guessing from a serum I was testing) and anything I was putting over-top of them was painful. This didn't give me any bad reactions, and definitely aided in certain areas. I'll definitely be keeping this as part of my skincare routine. My skin just drinks it up. At $72 Canadian dollars, it is a little pricey. But like I mentioned above, such a little amount is needed when you apply the balm to your face, and can be used as a multi-purpose skincare item. You could even use this on your elbows, and cuticles. The fragrance is a little strong, but I'm willing to look past it because my skin is just loving it so much.